These roses are so full of petals. I have never seen them open all the way. This is a type of climbing rose. Someday I hope it fills the trellis out front. This entry was posted on Saturday, May 1st, 2010 at 10:33 am and is filed under Garden and Uncategorized. Tagged: Garden. You can feed this entry. You can leave a response, or trackback from your own site. wow! 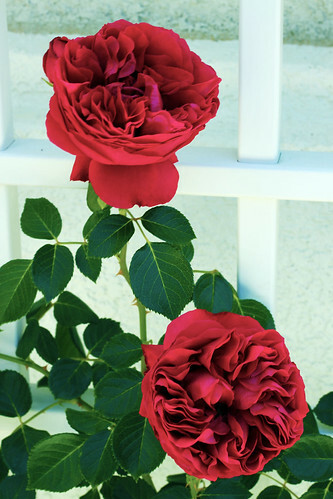 those roses have a huge number of petals – and a gorgeous rich red! They are absolutely gorgeous! You’ve photographed the red beautifully – something I found very hard to do. Absolutely stunning – a beautiful example of the perfect rose. And I agree – photographing red is hard to capture and you are right on! So many petals! Very beautiful. « Where are the roses?